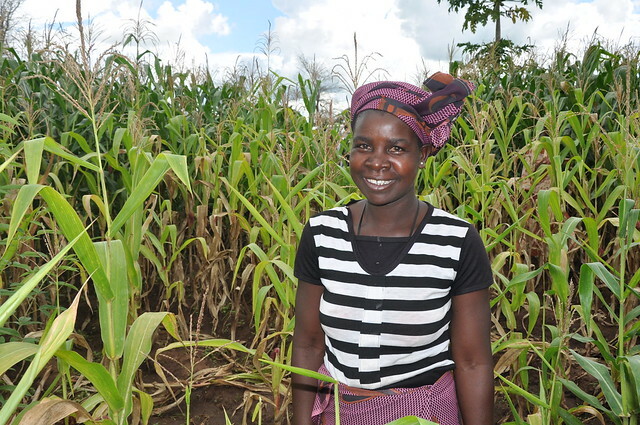 A farmer standing next to an Africa RISING demonstration plot in Malawi. Photo credit: Kathy Lopez/IITA. The successful scaling of agronomic practices and technologies demands that scientists and development partners consider gender issues at the household and community level (and beyond). Important questions are: how do male and female farmers evaluate new agricultural practices? How do they differ in their preferences for adoption? How do they perceive various extension approaches? 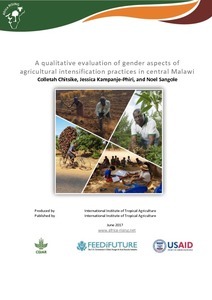 As to how male and female farmers evaluate new agricultural practices, results from this qualitative study showed that female farmers tended to evaluate technologies in terms of household food security, while male farmers more often opted for technologies/varieties that are demanded by the market. With regards to preferences for adoption of specific technologies promoted by the project, both female and male farmers mentioned a preference for adopting the following practices and technologies: intercropping, doubled-up legumes, maize fertilized with NPK and urea using the Sasakawa method (i.e. planting one plant per station spaced 25 cm apart) and the use of Gliricidia and Faidherbia albida as supplementary feed to livestock. However, men and women differed in their choice of crop combinations for intercropping and doubled-up legumes. The findings of this study make a strong case for the need for projects implementing research and development activities to gain in-depth understanding of gender dynamics and relations at household and community levels as a starting point for ensuring effective uptake of technologies. In the Africa RISING context, these results will be essential in informing research and discussions in the program’s second phase. Tags: AfricaRISING, Report. Bookmark the permalink.